Perhaps no volume of the Joseph Smith Papers conveys the highs and lows of Joseph Smith's life better than Documents, Volume 5. Through letters, revelations, and meeting minutes—as well as more unusual documents such as a map, an essay on abolition, and a study of the Egyptian language—this volume brings to life the consequential and often emotionally charged months from October 1835 to January 1838. Christian Heimburger is a historian for the Church History Department, The Church of Jesus Christ of Latter-day Saints. Although this book is written by scholars using formats approved for scholarly publications, it is an interesting and informative read. Its is easy to follow and hard to put down. It is not a complete history of the Church. 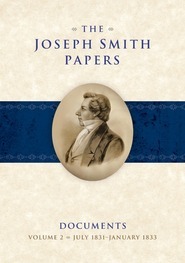 It examines the known documents of the period. I would recommend reading the the "Introduction" to get a sense of the general history of this time period. Then the reader could jump into any of the time periods of interest presented in the book. The Reference Material at the end of the book is a treasure of information - especially the "Geographical" and "Biographical" Directories. It is a fascinating read as well as a great reference book. Great addition to my library. I am enjoying the information on the context of several of the D&C sections (109 through 112 and 137. Good background information on Robert Matthew (Joshua the Jewish Minister) and his First Vision account. R. Devan Jensen is executive editor at the Religious Studies Center, Brigham Young University. He worked previously as an editor for the Ensign magazine, the LDS Church's Publishing Services Department, and Deseret Book Company.